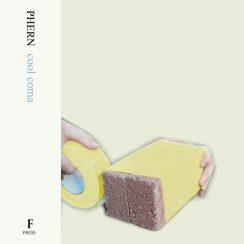 cool coma is the first full length release from Montreal’s PHERN a “super group” of sorts. Although the band is indeed composed of members of various Montreal acts (Moss Lime, Soft Cone and Sheer Agony) Ben Lalande, one of the band’s guitarists, scoffs at the term. Like its creators, cool coma, does not take itself to seriously. No track on the LP clocks in above 3 minutes. The album is jangly, fuzz soaked bi-lingual romp replete with psych synths, playful guitar exchanges and choppy, syncopated rhythms. Hélène Barbier’s vocals alternate between a languishing drawl and a lighter, punchier register that keeps the 14 tracks from feeling uniform. This jumping back and forth between vocal registers and styles creates a varied soundscape ranging from the psyched out opener “Excavator” which pulls the listener down the rabbit hole into the jangly “Pebble.” From here the narrative disperses with the synthy, stompy “Moving Boxes,” which has a surreal music video detailing the mystique of box lifting. Maybe it’s the bilingual nature of the project but every track here feels like it has two registers: a switch of time signature, change of vocal tone or surprisingly sharp riff that shifts the mood. Refreshingly, these tunes provide a succinct counterpoint to the oft rambling genre of psych-rock and in that spirit I’ll recommend the faux-anthemic “Late Retort” and the jazzy “Hospital Garden” and bring this review to a close. C’est fini, thanks for reading.